Some places are so special they simply deserve their own page. These places in particular are on many visitors' "must see" lists for good reason. Outspire guides will answer all your questions as you hike to give you a more in-depth look at these well-known spots and offer the chance to visit some lesser-known gems nearby. Even a short tour can give you loads of information that you won't get from a guidebook or likely see on your own. Your Outspire hiking guide will work with you to plan the perfect outing for your interests and needs. We take care of all the details, so you you don't have to worry about schedules or equipment. We'll provide the use of a daypack stocked with water, rain poncho, and adjustable trekking poles. Your hiking guide will carry maps, snacks, and emergency supplies. 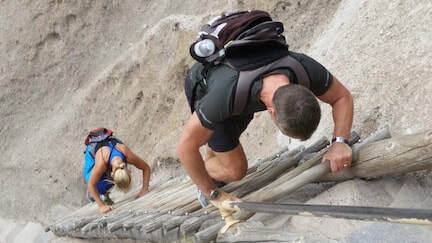 Hikers need only bring appropriate clothing, sturdy shoes, and a desire for fun! These special destinations are all outside the immediate Santa Fe area so please allow for the travel time. Add-ons: we always bring snacks, but a trail lunch can make a welcome addition to longer outings. Just ask! All our hiking tours are customized but here are a few itineraries to give you some ideas. And don't forget to see our other popular hikes (including our short summertime tours) on the Hiking page. Bandelier National Monument is a remarkable place. About 60 minutes drive west of Santa Fe, the park preserves over 3000 Ancestral Puebloan archeological sites across a plateau of volcanic tuff carved into warmly-colored, steep-walled canyons. There is a spiritual quality to the landscape here, deeply felt by the modern Puebloan people, who regard Bandelier as merely a stop on their long journey in this world. The famous cliff dwellings in Frijoles Canyon make for a great half-day of exploration, along a fairly level network of trails that everyone can enjoy. In summer and early autumn we can descend 400 feet down into the canyon along dramatic switchbacks and see the park as early visitors did, shuttling back at the end of our hike. Below us, tall and fragrant Ponderosa pines along Frijoles Creek shade many of the canyon walks and offer a chance to see wildlife as well as ruins. Bandelier gives us large amount of flexibility. If your time is limited, or if you have children who don't want to be out too long, consider visiting a section of the park nearer to Santa Fe which features a short, but exceptionally interesting loop hike of about 2 hour's length, with splendid views, ladders to climb, paths incised in volcanic tuff, cliff dwellings, and petroglyphs. But if you have more time to spend, we can arrange to hike some of the other 70 miles of trails in the back country of Bandelier, on remote plateaus rich in archeological sites and canyon overlooks - and very far from most visitors. The high Bandelier backcountry embraces part of the spectacular Sierra de los Valles along the rim of America's new Valles Caldera National Preserve. 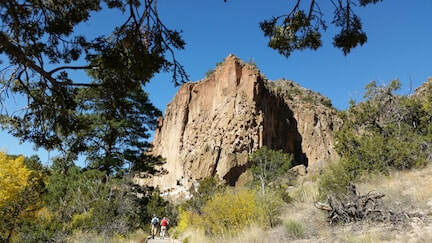 Trails in Bandelier give us access to the very edge of the volcanic caldera. You'll enjoy a raven's eye view of the floor of the lake that once flooded the caldera, lava domes, the resurgent uplift over the (still hot!) magma body below, and the Pajarito Plateau, built from ash ejected during the volcanic cataclysm. A hike here gives you a sense of what New Mexico must have been like 10,000 years ago, when nomadic hunters from the north followed animal herds as the Ice Age waned in North America. The caldera rim is best hiked from late May through late October. Summer thunderstorms are frequent in the Valles, so extra preparation, in the form of extra layers and rain ponchos, is important. Travel time: 1 1/2 hour On trail: 4-6 hours Please allow a full day to enjoy these trails, and strongly consider adding lunch. A 90 minute drive northwest of Santa Fe takes you out of the Rockies and into a vast Western landscape beloved by travelers, painters, and filmmakers: the spacious tablelands, juniper-dotted mesas, and glowing red cliffs of the Colorado Plateau. This is the country Georgia O'Keeffe fell in love with. Ghost Ranch was the artist's summer home for several years and the gorgeous landscape makes a perfect backdrop for a hike. One of the best is the short walk up to view Chimney Rock, a free-standing spire of brilliantly-colored Entrada sandstone. 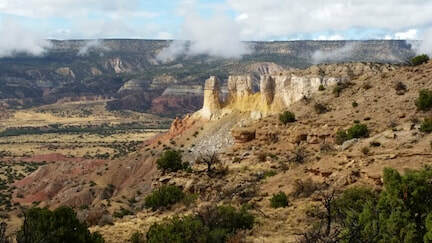 The 3 mile walk climbs approximately 500 feet for breath-taking views over cliffs and towers of orange sandstone and purple shale, the glowing Piedra Lumbre valley, and the blue volcanic highlands of the Jemez Mountains beyond. If this is your first trip out West, you'll love these hikes. Ghost Ranch captures something essential about the American Southwest. Travel time: 1-1/2 hour. On trail: 3 hours Other hikes / destinations in the area can be added for a longer day tour. 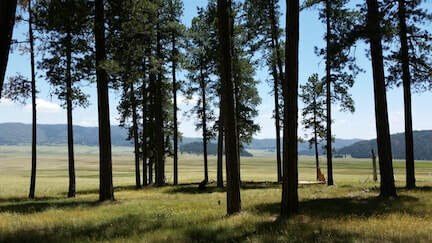 The Pecos Wilderness has long preserved some of New Mexico's most spectacular mountain scenery. If you have a full day to spend, lots of energy, and want to immerse yourself in the beauty of the Southern Rockies, this may be your special sanctuary, too. Wilderness outings are strenuous hikes of around 8 miles length, reaching altitudes of 10,000' after elevation gains of 1500' to 2000'. Alpine ridges surround the high, densely forested, and deeply dissected plateau that forms the heart of the Wilderness, drained by the Pecos River. Magnificent conifers grow here, together with beautiful groves of aspen. An amazing array of summer wildflowers bloom in this preserve, gracing streams and alpine meadows. In autumn the aspen forests add a golden note to the deep greens and ethereal blues of the plateau. The Pecos Wilderness is best hiked from late May through late October. Summer thunderstorms are frequent in these mountains, so extra preparation, in the form of extra layers and rain ponchos, is important.